When the movie The Passion, arrived in movie theaters six years ago, I did not go to see it. Everyone talked about how actually watching the scourging and crucifixion of Christ changed their life. And I was afraid to embrace it. My husband purchased the DVD. He watches it alone once a year, during Holy Week. Last year I watched it with him for the first time. While the suffering of Christ was very real and hard to turn away from, I was stunned to discover that I witnessed the Passion through Mary’s eyes and Mary’s suffering. I identified with her as a mother. Even though I have no sons, I felt her pain – a mother’s pain – watching her child suffer so terribly. I openly wept for her. The pain of knowing our Lord came to us to fulfill this prophecy, to fulfill this purpose, to open the gates of heaven for us and reconcile us with God through sacrifice for OUR sins to the Father, was not as intense as the pain I felt for Mary. As a young girl, she put her faith and trust in God, accepting His purpose for her life to bear a child, to raise this child, knowing who and what He truly was..
How proud she must have been when he began teaching God’s love and word. His first public miracle of turning water into wine was performed at her direct request. She kept him safe from Herod; leaving her native land for Egypt until it was safe to return. She feared for him when he disappeared, only to be found in the Temple. But this sacrifice. Did she know this suffering would be His calling for us on Earth? To watch him be bound and scourged. To observe his pain, powerless to do anything against it. To want to fight for him, protect him, comfort him. Would any mother be able to only stand and watch His destruction? Was she chosen by God for this motherhood in part because of the incredible strength He gave her? 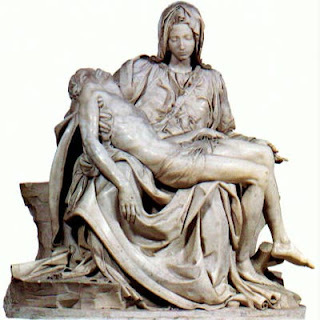 I can only imagine the depth of the faith that carried her through the terrible days before the Resurrection.